As a cunning part of our April Fool's Day joke Darren alluded to "some big news regarding our Points of Interest database" in a recent newsletter. Obviously our trick was that we had sold it to TomTom, but today we're happy to announce the real news! 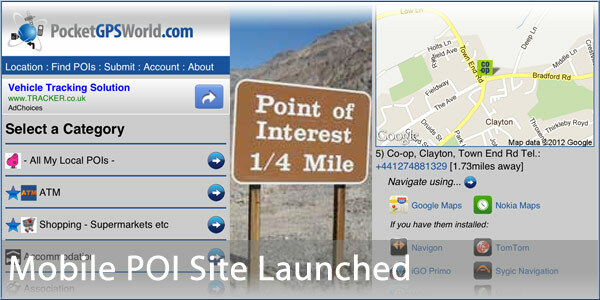 Our Mobile POIs site is now live! Over 210,000 locations across the world available at your fingertips. Simply point your smart phone (iPhone, Android, WP7, Nokia, Blackberry) browser to http://www.pocketgpsworld.com/mobilepoi and it will detect your location using GPS on most modern phones. If you don't have a GPS-enabled smart phone then you can also manually enter your location. Once located you can then either view all your local points of interest, or drill it down to a specific category and/or sub-category. Once you've found the POI you want you can then navigate to it using TomTom, Navigon, Sygic, Waze, Navmii, NavFree as well as viewing in Google or Bing Maps (all these are device dependent and may also require you to have the app installed on your phone!). If you are logged in to your PocketGPSWorld.com account you can mark categories and subcategories as favourites so that these show up at the top of the lists. As well as finding your local POIs you can also submit new ones easily (although removal requests and editing existing POI will be added at a later date). So then, head on over to http://www.pocketgpsworld.com/mobilepoi, bookmark it and/or save it to your homescreen and go see what's around you! As normal, very impressed with your work. All it needs now, is a dowbloadable icon to pin to my home screen. Will you be integrating with more sat nav apps? Co Pilot for instance? Already there fella! What device do you have? WP7: in browser select 'Pin to Homescreen' (sadly no way to get an icon though - but my brother has an app that allows custom text for home screen pins). Just checked on Co-Pilot Premium, and the ONLY share options it has, is to Share with Facebook and/or Twitter, so it seems it maybe isn't possible to integrate as with GoogleMaps. That's not really a "biggy", but would have been nice. Anyway, once again, well done lads :-) Keep up the good work. Just tried it, shortcut on a Home Screen and it "just works"
Great work folks, you guys just get better and better!! Enjoying looking around my hometown...........to see what I've got to add :-) fun fun fun an excellent webapp. It's got Favourites too! Mega-useful. You have shown the big boys a thing or two here. For as long as I've had a GPS enabled smartphone I've wondered why when I search for the nearest petrol, Tesco or whatever I then have to exit and remember the postcode and manually enter it into my sat nav app. I guess better integration is coming with the native Google maps app, as I can't seem to get the web based Google maps to realise it can give me turn by turn directions. Wow! From what I can see, there is not a single POI in Madrid!! Not the Royal Palaces, Not the Bernabeu Stadium, Not even the Airport. Does everybody just head for the Costas and not bother with culture? excellent location detection but on asking for ATMs near my house, it showed my nearest ones as being in Nice and Bordeaux which are over 400 kms away! In fact the nearest ones are 8-10 kms from my house! In fact the nearest ones are 8-10 kms from my house! Human nature I'm afraid. Someone else will do it. Very true Oldboy. Sad really.